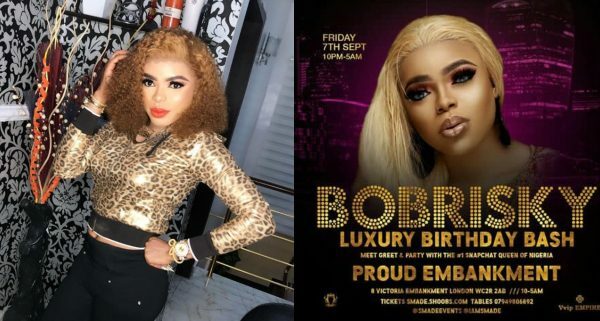 Bobrisky has finally returned to social media hours after news surfaced that he was denied entry into the United Kingdom, where he was scheduled to headline a meet & greet event with his London fans. According to Instablo9ja which broke the story, the socialite was held at a detention camp near the Heathrow airport in London, from where he was placed on a return flight to Lagos. The blogger added that the Bobrisky was apprehended by the border officers because he doesn’t have the appropriate permit to work in the U.K. since he intended to earn money from the meet & greet event. Plus, he reportedly was in possession of creams he had planned to sell. Now, Bobrisky has shared more details about all that happened, saying that he came home “voluntarily” to get the right visa and would be returning to the U.K. soon. “I want to say a very big thank you to all my Uk fans who really want to see me badly. I know some of u have got true love for me but trust me it hurt me that I cried dis morning because I was not able to see people who truly loved me and appreciate me. As for the haters who think I was deported or banned from entering the Uk that is a fat lie. I was only asked to go get the right visa. U all forgot so soon that I’m a strong soul, nothing can break me .And as for the SNITCH who went to tell the immigration I’m coming to work so sad u are pained that u can see me grow in success. Let me correct ur impressions darling we know u but i won’t mention ur name I went to Uk to relax and enjoy myself not to make money . I make nothing less than 1million a month in my country, I became so famous in my county, Snapchat pay me in my country so tell me why I won’t love my country NIGERIA . Out of dis money I make monthly I still help the needs who need my help. 0 Response to "“I Came Home Voluntarily to Get the Right U.K. Visa” – Bobrisky Says He did not Get Deported"